From the Shadows now has 1,000 GFC followers! To celebrate, I am having a follower giveaway. Three fab prizes for three lucky winners! I am giving away a $10 Amazon Gift Card, a Spirit Storm tote bag to hold your new signed copy of Spirit Storm and fun Spirit Storm swag (US), and a copy of She Smells the Dead from The Book Depository (international). To enter, please leave a comment on this post including your email address (so we may contact you if you win). This is a follower giveaway so you must follow From the Shadows on GFC (Google Friend Connect) or Twitter to enter. Some giveaway prizes are international (please see above). Giveaway ends March 9th midnight EST. Congrats on the 1000 followers! I still have yet to read your books but I really would love to. Thanks for the giveaway I'm a GFC follower. I follow you on GFC (Austine D) & Twitter (austine94). Also follower on Goodreads (Austine). Congratulations! I am an old GFC Follower... but just recently started using Goodreads more, so I sent you a request there. Wonderful giveaway, but really - congratulations! Nice! Congrats on 1000 =) Your blog is awesome that's why ;) Count me in please. Congrats on reaching 1000! That is a fantastic milestone! I'm a GFC follower, and a confirmed email subscriber. +5 Also, I follow you (and am friends with) you on Goodreads.com! Hi Congrats on 1000 followers. Thats awesome. Congrats on top 30 spot and the 1,000 followers! Would love to be entered into the giveaway. The book, tote and swaggy stuff looks awesome. Am a new GFC follower. Am a not so new Twitter follower. +5 and Am a Goodreads friend. Congratulations! I am a follower both here and on Goodreads. Congratulations on reaching this milestone! I follow on this blog. I follow you both GFC and Goodreads. Congrats on so many followers!! Congrats to so many followers! I follow you on this blog. Congratulations on hitting the big 1000! I loved She Smells the Dead and really look forward to the rest of the story! Yay! Congrats, EJ! I'm a GFC follower and +5 cuz I follow on Goodreads, too! This is a great giveaway, I can't wait to read both of these books!!! Congrats! I'm so happy for you!! I'm a GFC follower and a friend on Goodreads. I just bought a copy of She Smells the Dead and it's awesome. Fingers crossed I get lucky and win Spirit Storm. Congrats on hitting the 1000 milestone and many many more. I'm follower GFC and Goodreads. I know I keep saying this, but I'm so proud of you Erica. Wow! E.J. Congrats on 1000 followers. The swag looks awesome too. Congratulations on the big 1000!!! Wow! What a milestone! Congratulations, EJ. Hi EJ Congrats on 1000 followers! I follow you on GFC, Twitter (@Misha_1989) and Goodreads(Misha). Congrats on reaching 1000 followers! I follow on GFC, twitter (@jsubject) and Goodreads (Jessica E. Subject). Thanks for such an awesome contest! I would be international. Congrats on all your followers!! Thanks for an AMAZING contest!!! I love all your giveaways!!! and congrats!!! !hope we grow more!! I follow your blog, and on twitter @siderealday. Kisses from Greece! !Hope to have your books and in greek soon!! Yay!! Congrats on reaching 1000! I am an old GFC and Goodreads follower. Congratulations on reaching 1000! Way to go! Congrats for all the followers. Thanks so much for the giveaway! I'm a GFC follower and a goodreads follower, too. E.J. - How cool is that, that you're in the top 30 most followed people on Goodreads this week! Way to go! Roll on the 2000 mark by the end of the year ! Followed on Goodreads, now follow here too! Great giveaway, thanks for the chance! Congrats on the followers here and for the Goodreads props! I'm a GFC follower here. And What a Great Giveaway! gfc follower and goodreads friend. 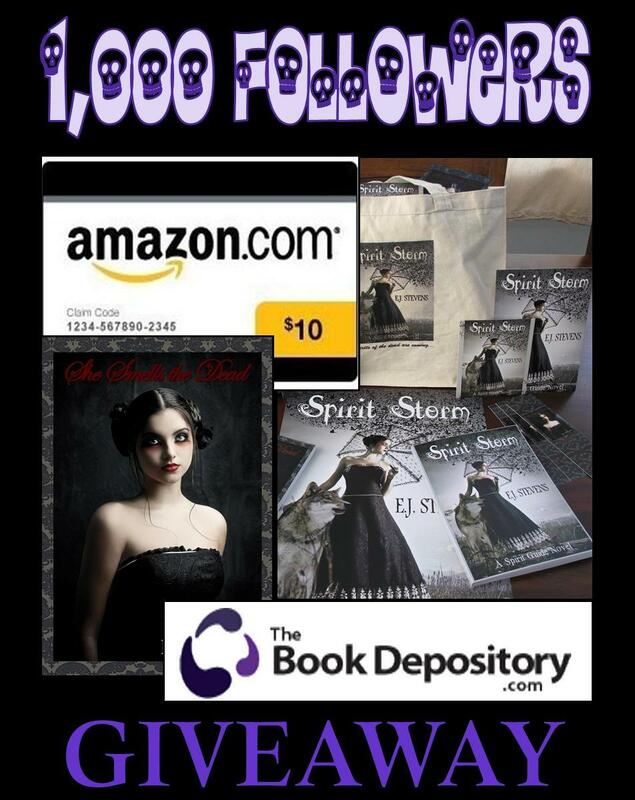 Congrats on your 1000 followers, which is now 1020 followers, and this giveaway is awesome! I'm a GFC follower and I'm a Goodreads follower (titania86). Congrats on all the followers! congrats on the top 30 and 1000!!!! if theres aplace im following I love your work you rock!! Congrats on the 1000 followers - and hitting the top 30 on Goodreads(: I follow you on GFC and is a friend on Goodreads (majasol). And I just found your Twitter too which I now follow (majaish). Congratulations and thanks for the giveaway!!! Congrats. Pick me, pick me, pick me. Congrats on the 1000 followers here and on making the top 30 followers on Goodreads for the week! I am a follower via both GFC, Twitter (Maria_Smith_76) and Goodreads (Maria Smith)! +5 Follow you on Goodreads. I'm a GFC follower and a follower on Goodreads (Katrina). Congratulations on all the followers! Congrats on so many followers! Hi Congratulation on your 1000 followers. I'm a GFC follower(DarkBloodyVamp)and I'm friends with you on Goodreads (Ollie). Congrats on your 1000 followers !! I follow From the Shadows on GFC. No need to put me in your giveaway EJ - Just wanted to say congrats on your 1000 followers! wow! I'm a GFC follower and a twitter follower. Yay! Congrats on 1000+ GFC followers and making the Top 30 Most Followed People on Goodreads!!! whaou ! more than 1000 followers now you rock ! Wow, way over 1000 followers now! Thanks for the giveaway! Thank you!!! And Congrats again!! Congrats!! Count me in please!!! woot woot Congrats on reaching 1000 followers!!! Thank you for the chance to win and congratulations on having 1,000 followers! I actually bought a copy of each book to donate tothe library but I'd love to have copies of my own! Awesome! congrats on the followers! and thanks for the giveway chance! I am following you on twitter..
congratulations on reaching 1,000 followers! I know that today we are even more! I'd like to be entered in the contest. Glad it is also international. I'm a GFC follower as well as a GOODREADS follower. Congrats! Thanks for the chance to win this giveaway! Congrats on 1000!! Im a GFC follower and +5 for Goodreads. Thanks for the great giveaway. I'm a GFC follower as sablelexi and a Goodreads friend as Jennelle S.
What a great giveaway! Thanks for the chance!! !